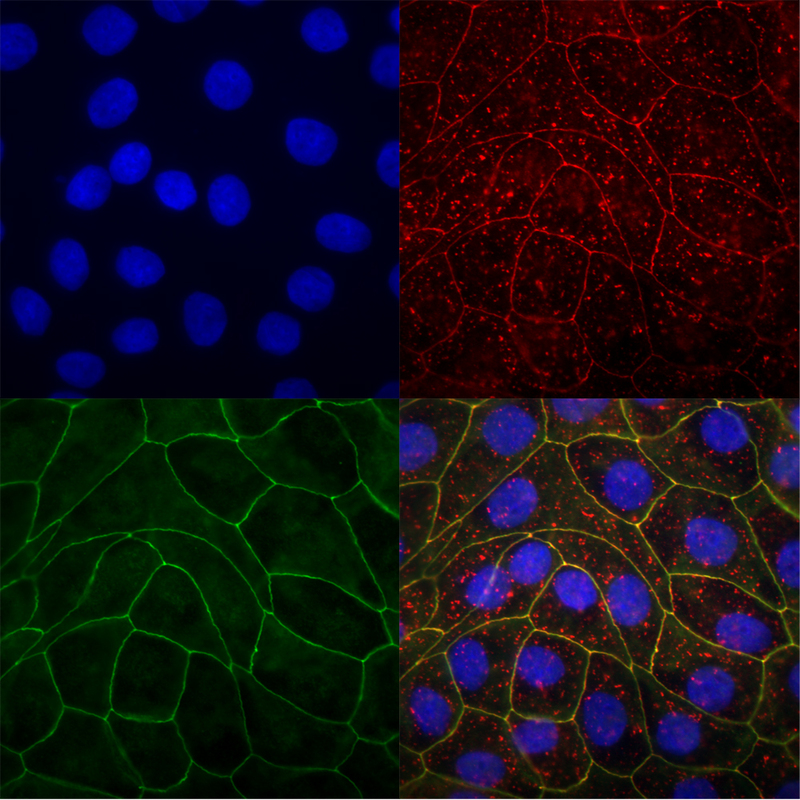 This protocol is designed for staining junctional proteins in epithelial cells cultured on Transwell filters. Please refer to "TJ Envornment" at TIGHT JUNCTION home page for growing epithelial cells. (1) Take cells (12 well plates) from the tissue culture incubator and chill the cells at 4 degrees celsius for at least 3 hours. You can perform the entire fixation procedure in a cold room. Alternatively, if you want to do it on your bench, make sure you move fast and keep all solutions cold (on ice). (2) Prepare methanol containing 12 well plate before starting setp (2). Add 100% methanol (-20 degree celsius) to each well. Fill to the top and sit the plate on ice. (3) Rinse cells by trasfering the Transwell sequentially to 5 beakers of chilled PBS (on ice). (4) Remove excess buffer from the outside of Transwell. (5) Use a pipet tip to remove buffer from Transwell as much as possible. Do this quickly to prevent drying of cells. Proceed to next step immediately. (6) Drop the Transwell into a FULL well of 100% methanol (-20 degree celsius) tissue culture plate. Methanol will flow into the Transwell cup from the basal well. (7) Repeat steps (3) to (6) for each Transwell. (8) Put the Methanol/Transwell plate in an air-tight container. Fix the cells at -20 degree celsius overnight. (9) Remove methanol from Transwells quickly by inverting the Transwell. Add 100% acetone (-20 degree celsius) to the Transwells. Remove acetone after ONE minute. Prolong acetone incubation is REALLY BAD because acetone dissolves the Transwell (polystyrene). Move fast or do one Transwell at a time. (10) Sit the Transwells up-side-down and let air dry. (11) Store fixed cells (dry) at 4 degrees celsius in a 12 well plate. (1) Use a razor blade and excise the Transwell filter from the cup. You can stain the whole filter or cut it into several smaller slices. A fine forcep is very handy for manipulating small pieces of filters. (2) Hydrate the filter with cells facing up in IMF buffer (0.1% TX-100, 0.15 M NaCl, 5 mM EDTA, 20 mM HEPES, pH7.5, 0.02% NaN3 as preservative). Use a 48 well plate for small filter pieces and 24 well plate for bigger pieces. Make sure the filters sit at bottom of wells. Sometimes the filters move around during changes of buffer, so check the filters throughout the staining procedure to make sure that cells are facing up. (3) Rinse filter twice in IMF buffer. (4) Add primary antibodies at final concentrations of 1-10 microgram per mL in IMF buffer. Add 0.1 mL to each 48 well or 0.3 mL to each 24 well. Incubate 3 hours at room temperature or overnight at 4 degrees celsius. (5) Wash filters 3 times 15 min each in IMF buffer. (6) Add secondary antibodies at final concentrations of 1-10 microgram per mL in IMF buffer. Add 0.1 mL to each 48 well or 0.3 mL to each 24 well. Incubate 2 hours at room temperature. (7) Wash filters 4 times 15 min each in IMF buffer. (8) Optional: stain with Hoescht 33528 in PBS at 10 microgram per mL for 60 min. Room Temperature. Rinse 4 times with PBS. (9) Rinse filters once with water. (10) Add ice cold 95% ethanol to each well. Let fix for 1 hour at 4 degrees celsius. (11) Mount filters with cells facing up. Place filter on a glass slide, add a drop of antifade reagent/mounting medium (ProLong Antifade from Molecular Probe is recommended). Cover filter with a glass coverslip, let cure overnight before sealing. Room temperature in dark.